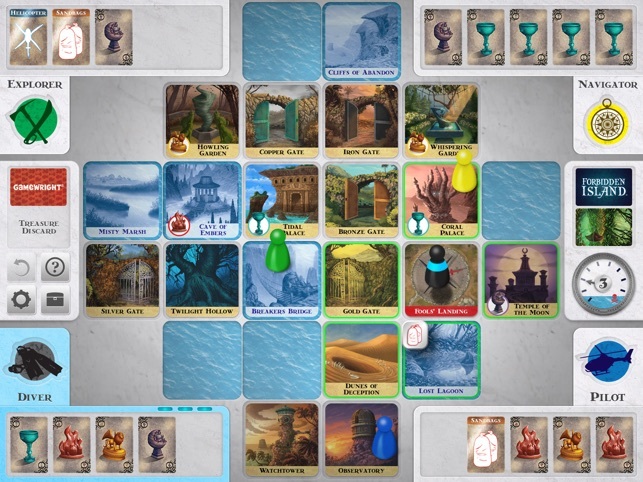 Forbidden Island is a cooperative game of strategy and courage as you and up to three other adventurers attempt to capture the four ancient treasures hidden on a sinking island. 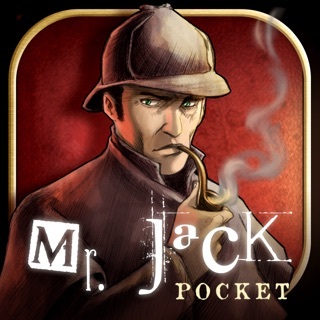 It's a thrilling adventure based on the best-selling Gamewright board game. Forbidden Island was the secluded retreat of an ancient mystical empire known as the Archeans. Legend has it that the Archeans possessed the ability to control the Earth's elements - fire, wind, water, and earth - through four sacred treasures: The Crystal of Fire, The Statue of the Wind, The Ocean's Chalice, and The Earth Stone. 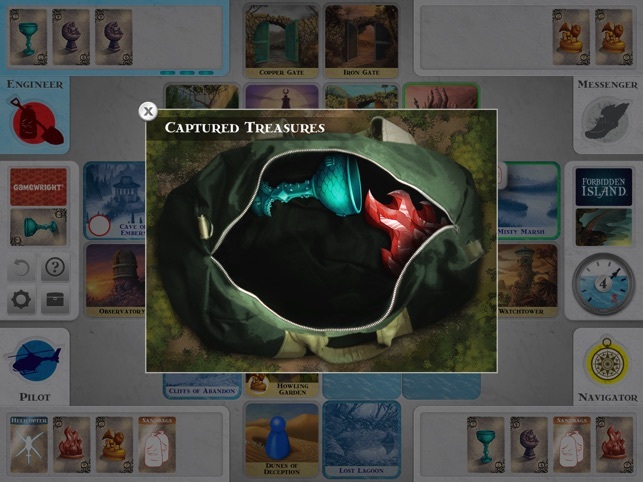 Because of their potential to cause catastrophic damage if they fell into enemy hands, the Archeans kept the treasures secretly hidden on Forbidden Island and designed it to sink if intruders ever attempted to claim them. 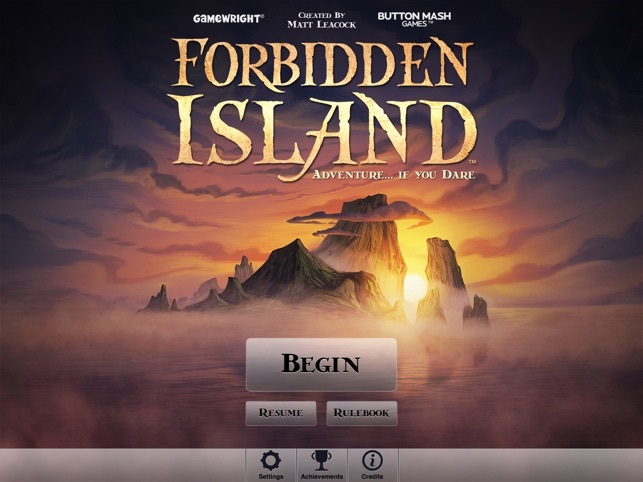 In the centuries since the mysterious collapse of their empire, Forbidden Island remained undiscovered ... until now. Will your team be the first to breach its borders, capture the treasures, and make it out alive? Awarded as Mensa Select in 2010 and nominated for the prestigious Spiel des Jahres award in 2011, Forbidden Island is a fantastic game that's fun and engaging for all who play. ∙ Facebook and Twitter integration. Share your Achievements! Tested and compatible with iOS 11. We've decided to remove the Facebook and Twitter integrations. They weren't being used very much anymore and the Facebook API we were using was recently deprecated and started causing crashes. But that's all fixed now that we've removed it. I got this app recently. It is fun and suspenseful. However it is hard. The first time I lost because of Fool’s landing sinking, which is kind of unfair because you have no control over the deck and Sandbag cards are rare. Also, I think the islands should be bigger. I know this would make it different from the original game but it would make it easier. Also, I noticed some people complaining about the number of times the waters rise cards appear. This isn’t too much of a problem for me but it is a little annoying. They seem to come up from the deck much more than in the regular game. 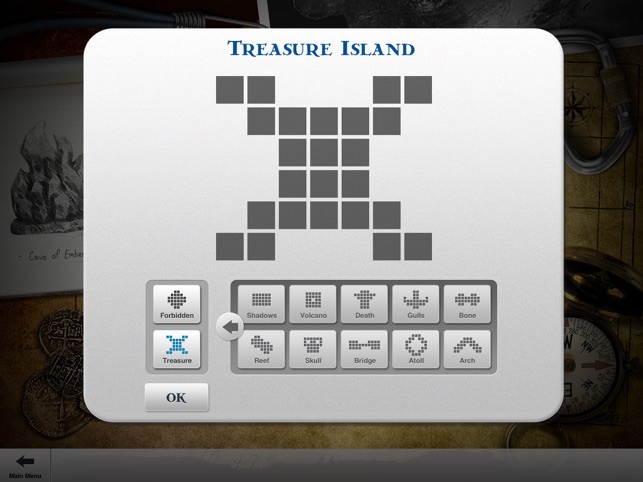 Also, what is easier: Treasure island or Forbidden island? I love it. When I saw the app I was jumping up and down. It's great. I completed it after 1 try. But my one problem is that I don't think that there should be in app purchases. I think that the game is already a lot of money (totally worth it though) but I don't think that you should have to pay to have more shapes of islands. I also think that you should make a create your own island thing so you can be creative. Please just consider that. I love the game!!! This a strategy game that requires some thinking ahead about your moves. I had to play several times to come up with a strategy to win the first time at Novice. Now that strategy works most of the time. At the Normal level, my strategy only works about 1/2 of the time. Working to refine that strategy, then on to the top 2 levels. Don't expect to win the first few time, and remember to think strategically. © 2011 Gamewright & Button Mash Games Inc.